Our philosophy embraces a commitment to vocal and performance excellence. If you share this ambition, we want you to join us on our journey! You don’t have to know how to read music or have a professional quality voice to join. We emphasize dedication to vocal improvement. Most of all, we have FUN! Once you have attended at least three rehearsals within three months, you are eligible to audition to become a member of the chorus. You may either sing in a quartet with three other members in a private audition held in front of the music team (four section leaders and the director) or you may choose to record yourself singing in the chorus on the risers, and your recording will be evaluated by the section leader and the director. Please see your section leader or the membership chair for complete details on the audition process. Who can sing in the Southern Oregon Sound Chorus? Women of all ages who love to sing! 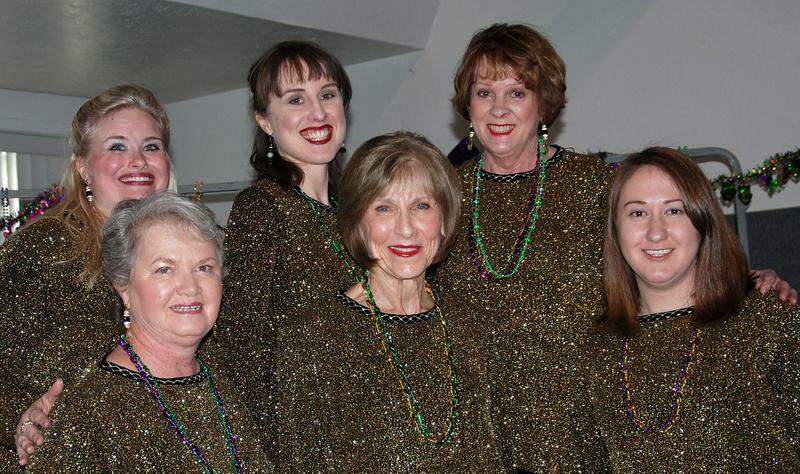 Why sing in a Sweet Adelines Chorus? hobby, perform for our community and test our skills at annual competition. Do I have to be an accomplished singer to participate? Absolutely not - if you can carry a tune and love to sing, we'll teach you the rest. No - many of our members don't read music - we provide CDs to help you learn your part. What if I can’t sing with vibrato? Not a problem - the barbershop style of music does not use the vibrato technique. What if I naturally sing with vibrato? Our vocal exercises will help you learn to control your vibrato. I can’t sing very high (soprano). Is there a place for me? voice ranges (baritone and bass). The more, the merrier! puts goose bumps on your arms and brings a smile to your face when you hear it. Do I have to sing in a quartet? No, there is no requirement to sing in a quartet. What about costumes. Do I have to know how to sew? No - though we do make many of our costumes, our members who sew are willing to help.